Wild Apricot partner providing design, development and system setup services for clubs, associations and charities. *Group accounts do not include recurring member charges. To get access to this feature, you must choose the Community plan or higher. **By default, 2GB of storage allocated to each account. To empower you with key insights and best practices to succeed. Access to over 120 articles on our “Wikipedia of Membership”. Access to the Wild Apricot Podcast on the go. To connect you with your peers and experts who have been in your shoes. Live webinars with industry experts. Access to our Membership Advisory Group. 1-on-1 interviews with standout peers. Free, industry-renowned tech support (email and international phone). Comprehensive online help and video tutorials. Community forums to connect with other Wild Apricot users. 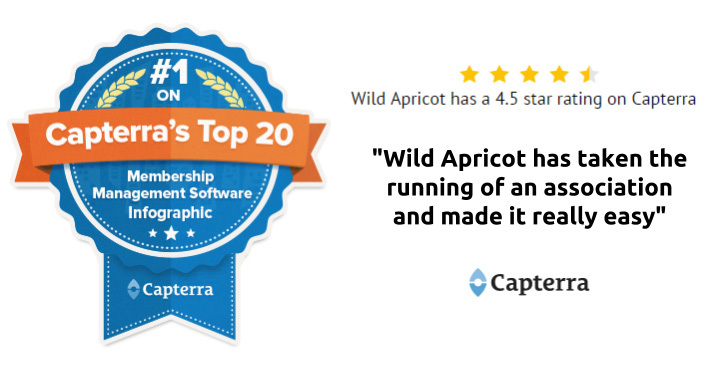 Wild Apricot received the coveted #1 spot in Capterra’s Top 20 Membership Management Software Infographic now for six years in a row. Capterra, an authority on business software noted, “for the purpose of this ranking, Capterra focused specifically on solutions that include membership management as their core function“. Wild Apricot lets you sign up for a free trial with just an email address, there is no credit card required. Only once you are ready to upgrade to a paid subscription will Wild Apricot ask for your payment information. What do I get with the free trial? All free trials provide the features and functions of our “Community” account level for 30 days. After the 30-day period, if you have not upgraded to a paid subscription, your account will switch to the free, ad-supported plan, so you will not lose your trial account data, and can continue to use Wild Apricot. Are there any additional transaction fees? Wild Apricot’s plans are flat-rate, all-inclusive pricing for system access, regular upgrades, and full customer support. Wild Apricot has no setup fees, no customization fees, no training fees, no per-transaction fees, and no cancellation fees. The only additional fees you might have to pay are to your third-party payment provider if you choose to setup online payments. Do you offer any setup or customization services? Wild Apricot is designed to be self-service software. Help documentation and customer support teams are always available to answer your questions. If you would like to use additional services such as graphic design, data transfer, training or advanced website customisation, an independent service provider like Highland Creative can help.